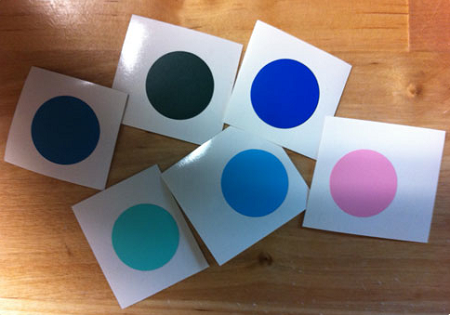 Use our vinyl decal color samples to match against a paint sample, fabric, furniture, try on textured walls or other surfaces. 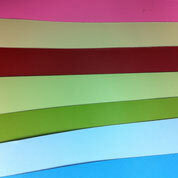 We'll send you 3 small swatches of our actual material. Need additional colors? Add to your cart separately in multiples of 3. It's best to test first!! Any glaze or faux paint finish. Flat or Satin Paint - may require additional patience & pressure for application. Egg Shell Paint - may not stick. Please order sample kit for testing. Heavily Textured Walls may not accept vinyl application. Knock Down Textured Walls may experience difficulty with decal edges lifting. Unpainted cinder block, wood or other rough surface. Painted wood or plywood, may have difficulty with decal edge lift. Painted paneling, product may pull some paint from paneling when removed. Cracked, Crumbling or Peeling walls (plaster or paint). I'm so pleased with the wall decal I got from RightOnTheWalls. Custom order turned out perfect... got color sample to make sure the color was what I wanted. Good turnaround, great service. THANKS! 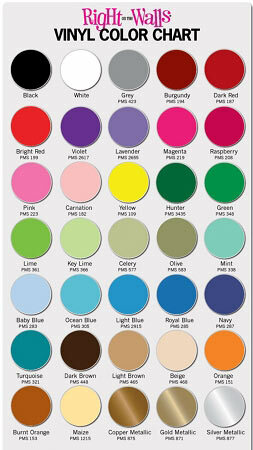 I am so thankful to have ordered color swatches before placing my final order. The colors that showed on my computer were not exactly the colors of the vinyl samples I got. The color matching was important for my beach house, so they recommended I get samples to test before I ordered. 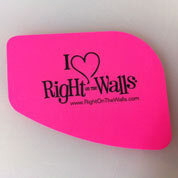 Thank you for your recommendation - I am so happy with my color matches and wall decals. I'll be back to buy some more & recommend you to all my friends and family too.